Is Uganda’s Judicial System Ready to Prosecute Serious Crimes? Last week, Lord’s Resistance Army commander Dominic Ongwen willingly turned himself over to the authorities. As second in command to infamous LRA leader Joseph Kony, Ongwen had evaded charges at the International Criminal Court since 2005 for his alleged role in atrocities in northern Uganda. Ongwen was captured by the LRA at a young age of 10. He rose through the ranks and allegedly became one of the most ruthless LRA commanders responsible for atrocities in Uganda, the Democratic Republic of the Congo, and the Central African Republic. Following his surrender, the government of Uganda was quick to announce that instead of facing trial at the ICC, Ongwen should answer for his crimes in Uganda, a position consistent with the country’s ongoing resistance to intervention by The Hague-based court. (As late as December, President Yoweri Museveni stated that he was considering withdrawing from the Rome Statue of the International Criminal Court completely). Only 48 hours later, however, Uganda, in cooperation with the United States and the Central African Republic, allowed the LRA commander to be transferred to the ICC. Regardless, Uganda continues to profess its ability to conduct fair trials for serious crimes, and claims that when it comes to accountability for the actions of groups like the LRA, its International Crimes Division is up to the task. A new ICTJ publication tests this claim, taking a closer look at how Uganda’s justice system has grappled with prosecuting higher-level complex cases involving serious crimes. The new briefing, “Pursuing Accountability for Serious Crimes in Uganda’s Courts: Reflections on the Thomas Kwoyelo Case,” co-authored by ICTJ's Sarah Kasande and Meritxell Regué, highlights outstanding issues regarding Uganda’s controversial amnesty law that arose during the trial of another former LRA commander, Thomas Kwoyelo, who is being prosecuted in Uganda’s national courts for war crimes. “The case of Thomas Kwoyelo illustrates how Uganda’s amnesty process is a major hindrance to the pursuit of justice and accountability,” said Sarah Kasande, Program Associate with ICTJ’s Uganda office, and co-author of the report. The International Crimes Division (ICD) of the High Court of Uganda was a product of the Juba Peace Negotiations that intended to end hostilities between Uganda and the LRA. Following a commitment made in 2007 by both parties to promote redress and to prevent impunity for perpetrators of serious crimes, the ICD was created as a special division of Uganda’s domestic judicial system with jurisdiction over those accused of the most serious crimes—including those considered international crimes, such as war crimes and crimes against humanity, as well as transnational crimes, such as piracy, trafficking and terrorism. According to the ICTJ briefing, the establishment of the ICD was viewed as a significant opportunity for Uganda to end impunity: If the ICD could successfully carry out its mandate, not only would victims be afforded justice, but its creation could build public confidence in the justice system as a whole. As the ICD began to incorporate existing domestic and international criminal law into its official rules, one law presented significant challenges to its operation: the Amnesty Act. The Amnesty Act was enacted by Parliament in 2000 at the height of the conflict between the Uganda’s People’s Defence Force, the LRA, and other rebel factions. It was intended to help end violence and restore security by giving combatants an incentive to lay down their weapons. The law may apply to any fighter who renounces rebellion against the government and meets certain other requirements. Those who qualify are not “prosecuted or subjected to any form of punishment for the participation in the war or rebellion or for any crime committed in the cause of the war or armed rebellion.” Applicants do not have to reveal their role in any specific crime as a condition of receiving the amnesty. A 2012 estimate by the Amnesty Commission put the number of combatants who have been granted amnesty at 26,000 of which 13,000 are LRA fighters. Kwoyelo applied for amnesty under Uganda’s Amnesty Act while in detention, six months after his capture. Though required to respond to his application, the Directorate of Public Prosecutions (DPP) failed to do so and, instead, initiated criminal proceedings against him. Kwoyelo was charged in August 2010 with 12 counts of violating Uganda’s Geneva Conventions Act, including taking hostages, extensive property damage, and willful killing. Later, the DPP amended the indictment, adding 53 additional violations under the Penal Code Act. This would be the ICD’s first war crimes trial against an LRA leader. Proceedings against Thomas Kwoyelo began in July 2011. The trial could have been held in Kampala, where the ICD is located, but the government decided to bring Kwoyelo’s trial to Gulu, where the crimes had been committed. 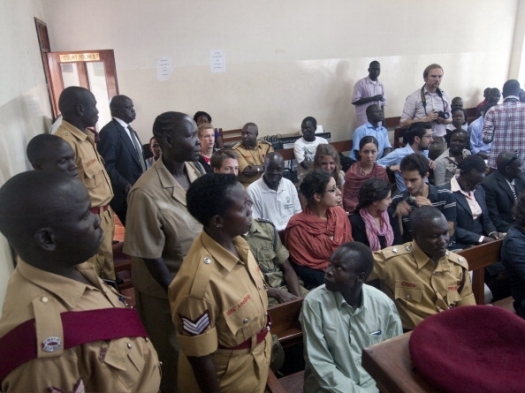 Dozens of local residents visited the Gulu courtroom to observe the trial. At times, the room was so crowded that a live video feed of the proceedings was set up nearby, under a tent, so that residents could follow them on a daily basis. The defense raised several preliminary objections regarding the constitutionality of the case, particularly the application of the Amnesty Act. In August 2011 the Constitutional Court addressed the defense’s two main issues. The first was whether or not the DPP and the Amnesty Commission, in failing to respond to Kwoyelo’s amnesty application, had violated his right to equal treatment and nondiscrimination under Uganda’s Constitution. The second concerned whether the serious charges of crimes could be considered to have taken place in the context of an international armed conflict. The Attorney General raised a counter objection which involved whether certain sections of the Amnesty Act were inconsistent with the constitution. Finding that Kwoyelo had a legal right to amnesty and that the DPP had failed to present an explanation for not processing his request, the Constitutional Court unanimously directed that he be immediately set free, ending the country's first war crimes trial. Shortly after the Constitutional’s Court decision, the Attorney General filed an appeal before the Supreme Court seeking to overturn the decision of the Constitutional court and to resume Kwoyelo’s trial. The Attorney General argued that Section 2 and 3 of the Amnesty Act conflicted with Uganda’s obligation under international law, to prosecute grave breaches and other serious crimes. In reply, Kwoyelo’s lawyers maintained that he was eligible for amnesty, and it would be contrary to his constitutional right to equal treatment under the law if he was prosecuted for crimes for which other ex-combatants were granted amnesty. The Supreme Court has yet to rule on the appeal. Meanwhile, Kwoyelo remains in custody pending the outcome of the Attorney General’s appeal. Kwoyelo’s trial has also opened important debates in Uganda on justice questions, including victim’s participation, reparations, accountability for state actors, and the protection of victims, witnesses and defense lawyers. According to the new ICTJ report, the Constitutional Court’s decision in the Kwoyelo case highlights the conflicting approaches to transitional justice in Uganda and the dilemma of pursuing criminal accountability while a blanket amnesty remains in place. Perhaps surprisingly, many civil society groups as well as religious leaders are wary of a possible repeal of the amnesty provisions because they believe it could endanger future peace efforts and prevent more combatants from laying down their arms. The ICTJ briefing outlines several recommendations for Uganda as it works to live up to international standards and promote peace and stability at home. It calls for the Amnesty Act to be amended to exclude those accused of so-called “international crimes”. It also calls for the DPP to publish a prosecution strategy that sets criteria for the selection and prioritization of cases. “Whenever the Supreme Court decides to hand down its final judgment, it will have major implications—not only for Kwoyelo, but for the future prosecution of serious crimes in Uganda. Hopefully it will mark a step forward towards the fulfillment of victims’ rights to justice,” said Kasande.